Today I am writing my 18th all done post. Firstly I made stretch denim jeans, more on that later. 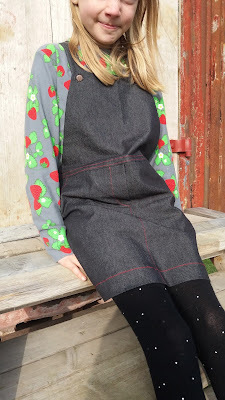 I had a piece left over which Big Sis spotted so she persuaded me to make her a dungaree skirt from an Ottobre magazine. I had enough for the main pieces and then used a floral fat quarter for the facings and pocket linings. We bought some Prym metal buttons to make it look like the real deal. I grappled with top stitching thread which incidentally needed the tension wheel on my machine to be on 7.5 to get a smooth thread tension. She is all arms and legs this girl! She wants the T-shirt now! No worries I love sewing for her. The skinny jeans were a little less photogenic which is why I have written about them second. I have made some simple skinny jeans using the Sew Liberated indie pattern. If you like wearing long tops or tunic button fly jeans can leave you with a lumpy stomach, so I thought this pattern would be pretty useful.From a toile I found out that they had quite a low rise which didn't feel right so I made the body pieces longer by 2 inches. This made for a much better fit. The piece above the yoke is ribbed jersey. 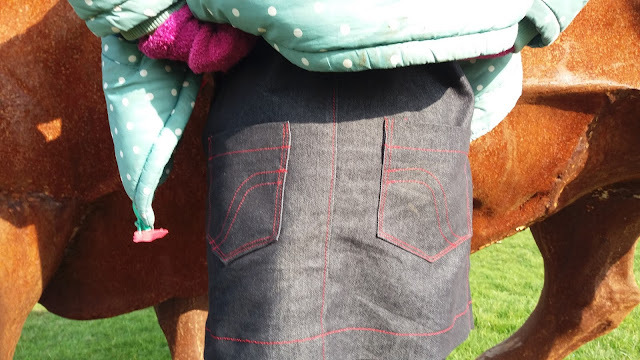 It is hard, and also expensive, to get ribbed cuffing knit fabric strong enough to hold up your trousers so inside the folded over knit fabric around the waist I sewed a piece of wide elastic on a stretch stitch before I folded it in half. This made it super comfortable and a suitable waistband. They are reminiscent of the maternity jeans I wore ten years ago! I stitched them together with yellow thread for an authentic look and designed the pocket pattern myself by drawing free hand in chalk and then ironing the other pocket on top to mirror the image. You can simply sew the inside and outside leg seams with a straight seam or go for a flat felled seam on the inside leg and crotch for a durable, authentic finish. All done with this stretch denim with two good items of clothing. 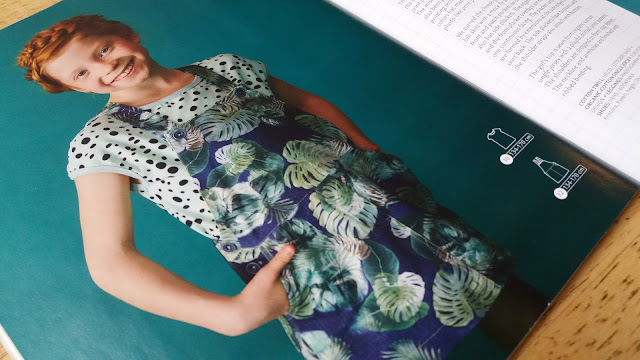 I have used sew liberated patterns twice now and I'm afraid I am not a fan of the sizing or the shaping - they require a lot or modifications for me. The patterns are on tissue and do not have enough markings to indicate which size you are cutting. All the lines look the same and lack numbers to show which size you need. The instructions are clear and well written but I have not been happy with the end result on either these jeans or the school house Tunic without the alterations I had to make. In my top ten indie patterns Sew Liberated is near the bottom of the list unfortunately. Such a great dungaree dress. I am jealous - I love the red top-stitching on it. Your stretch jeans look really professional! Those jeans are fab and love the dress too. You are a sewing ninja! 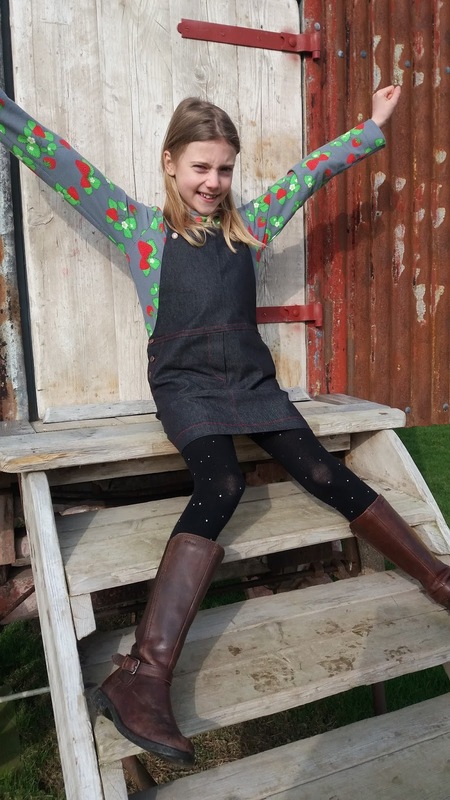 Love both jeans and dungaree dress. Your top-stitching is medal worthy. 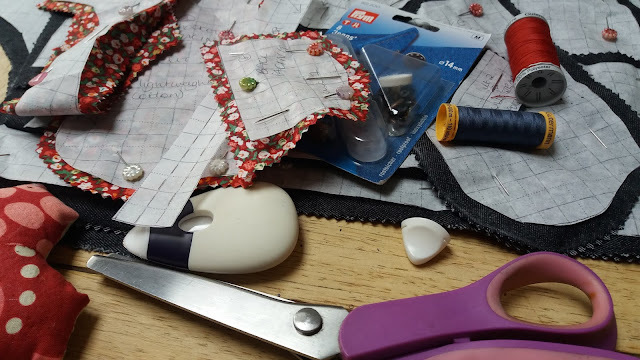 I have opened a SewLiberated pattern package, looked at it and closed it again. It is now in a charity shop. I feel less guilty now that I have read your review. The pattern was a birthday present once upon a time. Imagine the changes I would have to make (full bum adjustment, full bust adjustment, the lot). Wow, I am so impressed, Jo. I can't believe you made your own JEANS! They look really good on you. The skirt is adorable, it fits her really nicely. She's getting so tall and lanky! Your jeans are amazing! I love the topstitching on both of these garments. What a lovely idea to use a contrast fabric inside the dress too. You daughter looks so cute in the wonderful dungaree skirt. I am so impressed that you made your own JEANS, wow! Sorry the pattern was not your favorite but the modifications you made made the jeans perfect. I suffer from the tummy bulge/tunic tummy/thing. I look about four months pregnant all the time!